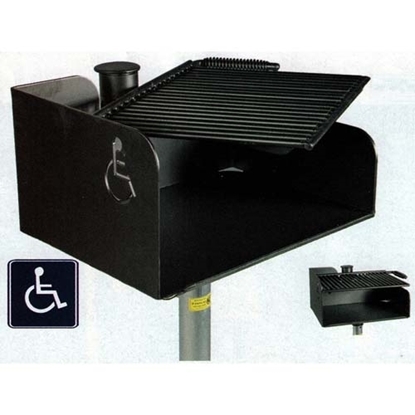 Pedestal Park Barbecue Grills provide the best in outdoor grilling. 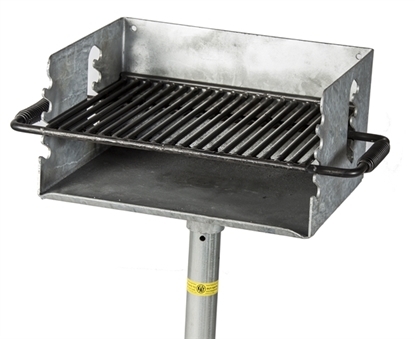 Pedestal grills are manufactured with heavy duty steel fireboxes, adjustable grills and attached galvanized pedestal posts for in-ground mounting. The non-removable grills reduce vandalism while still allowing cooking adjustments. The firebox swivels 360 degrees for wind control as you cook. The public uses commercial park grills at campground, picnic areas, apartment picnic areas, home owners associations HOA's, and campgrounds for BBQ. Our BBQ Grills are built tough to withstand frequent use and 24/7 outdoor exposure.